The video library is based on using the filenames or folder names to obtain online data. If they are incorrectly named, then there are no scraper results and there will be no library entry. 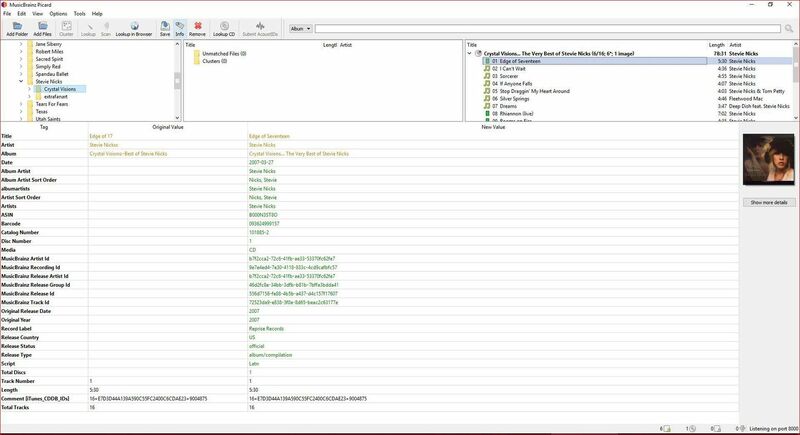 The music library is based on scanning tags embedded in the music files. It ignores the folder names and structure and file names. Proper tagging is essential to ensure the library is populated correctly. Having slight variations in the tags for artist and album names could mean duplicated and unwanted entries. The following is Kodi best practice. Remember use a layout that is nice for you, but tag accurately. Song files require suitable tagging for use in Kodi. While Kodi can scan minimal tags into the library, it can lead to errors in the library and subsequent scraping. We recommend music files are tagged with MusicBrainz as detailed below. Remember that Kodi does not extract any information from the filename, so the filename is your choice. Kodi is quite flexible with the folder structure. The diagram below is an example. You should group your albums in a manner that makes sense to you. To ensure Kodi and other add-on processes can function efficently and correctly, the following is recommended. A source folder contains your media collection- in this case Music. This folder is then set as a Source in Kodi which enables Kodi to access your Music. In the diagram from the previous section Artist Music, Compilations, Classical and Audiobooks are Sources. Most music files purchased or ripped by your favourite software have only minimal metadata embedded. Normally this is not a problem and works very well on simple music players. Kodi, being an advanced and feature rich player, requires greater accuracy with the embedded tags. Any slight variance in, for example, the Album name between the tracks from the same album will see multiple entries in the library for that Album. It is not uncommon to have a single album split into three similarly named albums. Also true for Artists. It is for this reason that there is a separation of the Scanning and Scraping processes for Music. The initial scan allows you to find and correct errors in tagging, before scraping. MusicBrainz Picard is the music file tagger software that can access the MusicBrainz database to locate metadata to embed into your music files. MBIDs are useful because names are not unique. The bigger and more diverse your music collection is, the more likely you will encounter Artists with the same name. They allow you to have different artists with the same name in your library e.g. "John Williams" the classical guitarist and "John Williams" the film music composer and conductor. They allow the scraping process to be more efficient, otherwise an extra call is made to try and get an mbid first to use at the scraping sites, and each request from Musicbrainz must be throttled to 1 per sec which will slow the scraping process. The black entries at the bottom of the list indicate no change to the existing tags as they are correct or not used by MusicBrainz. For the best tagging experience set the correct options in Picard, particularly the "Clear Existing Tags" option in settings. This option means that any old tags that may cause issues are wiped, preserving only the musicbrainz tagging. It will also be wise to tag using ID3v2.4 compatibility. 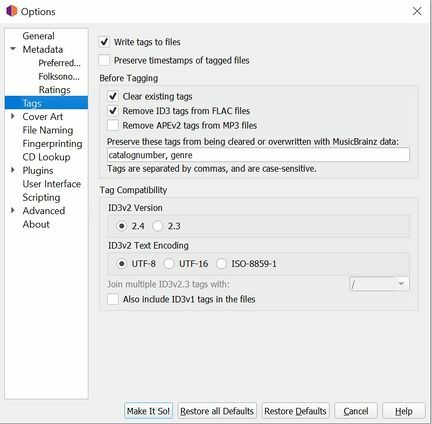 Once the music files are tagged, avoid modifying the MusicBrainz tags unless you clearly understand the relationship of the MBID's and the other related tags. For example, embedding MBID tags, but then editing the Artist tag or Album Artist tag will result in incorrect entries in the library. If you need to change the artist or album artist tag you also have to edit the matching artist mbid tag and album artist mbid tag. If Kodi finds a release mbid it will expect the artist mbid tags to also be present. There is no requirement to use the Kodi CD Ripper. If you are comfortable using other ripping software, then we recommend you continue using that software. This page was last edited on 16 April 2019, at 08:14.